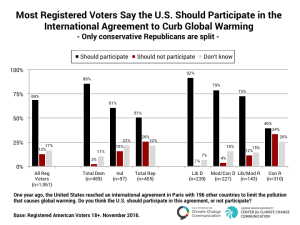 December 13, 2016 – (New Haven, CT) A new nationally representative survey conducted shortly after the election finds that, across party lines, 69% of registered voters say the U.S. should participate in the international agreement to limit global warming, compared to only 13% who say the U.S. should not. Likewise, 70% support setting strict carbon dioxide emission limits on existing coal-fired power plants to reduce global warming and improve public health, even if the cost of electricity to consumers and companies increased – a core component of the EPA’s Clean Power Plan. Democrats (85%), Independents (62%) and Republicans (52%) all support setting strict limits on these emissions. “After one of the most contested campaigns in American history, voters want President-elect Trump, Congress, and their own governors to act on climate change and clean energy,” said lead-researcher Anthony Leiserowitz, PhD of Yale University. 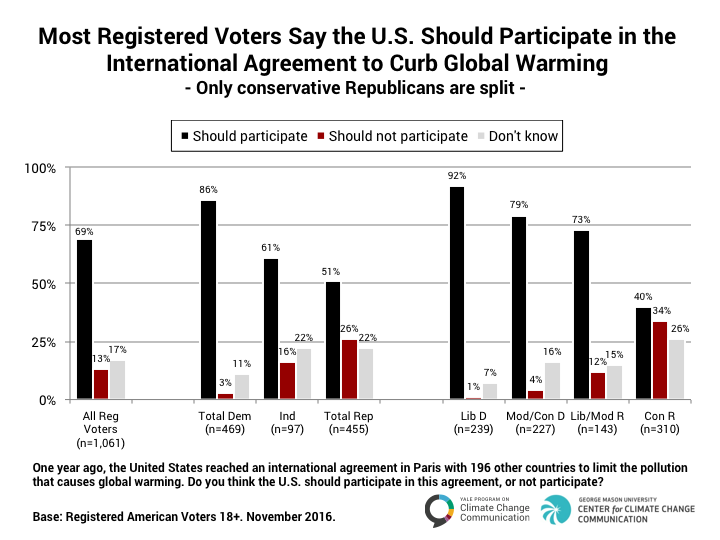 As strategies, 78% of registered voters support taxing global warming pollution, regulating it, or using both approaches. Only 10% oppose these approaches. If Congress passes a fossil fuel tax, the most popular uses of the revenue are developing clean energy (81% of registered voters support), improving America’s infrastructure (79%), assisting workers in the coal industry who may lose their jobs as a result of the tax (73%), and paying down the national debt (67%). Half of registered voters (51%) think government policies intended to transition away from fossil fuels and toward clean energy will improve economic growth and provide new jobs. An additional 21% think it will have no impact on the economy or jobs. Only 27% think it will reduce economic growth and cost jobs. Across party lines, a large majority of registered voters (83%) support generating more renewable energy on public land in the U.S. Comparatively fewer support more drilling or mining of fossil fuels on public land (47%). Registered voters support a major investment in the nation’s infrastructure (69%) including majorities of Democrats (75%), Independents (58%), and Republicans (67%). If Congress were to invest in the nation’s infrastructure, registered voters’ highest priorities are modernizing and improving the nation’s roads, bridges, and highways, followed by water supply systems, and the electricity grid. These findings come from a nationally-representative survey (Climate Change in the American Mind) conducted by the Yale Program on Climate Change Communication and the George Mason University Center for Climate Change Communication. The survey of 1,226 American adults, including 1,061 registered voters, aged 18 and older, was conducted November 18 – December 1, 2016 on the GfK KnowledgePanel. The full report is available to read and download.